Georges Lemaître was a mathematician and cosmologist. He established that the universe is expanding because space is stretching, producing red-shifts in light arriving from distant galaxies. He was the first person to derive Hubble’s law. 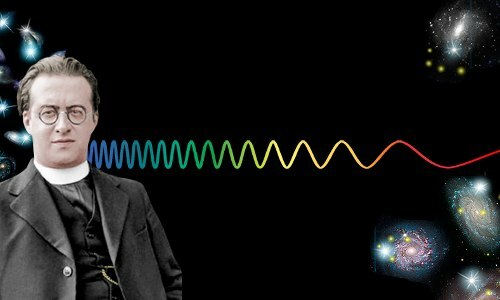 Lemaître was also the first scientist to propose that the universe and time itself began in a single instant. He advanced the theory of an explosion of a ‘primeval atom’ whose matter spread and evolved to form the galaxies and stars we observe today. His work indicated that the universe has a definite age. Georges Henri Joseph Édouard Lemaître was born on July 17, 1894 in the city of Charleroi, Belgium. His mother was Marguerite Lannoy. His father was Joseph Lemaître, a lawyer. Georges was the eldest of their four children. His parents were devout Roman Catholics, and at the age of nine, Georges announced that he wanted to become a priest. The following year, he enrolled at the Jesuit High School of the Sacred Heart in Charleroi, where he excelled in chemistry, physics, and mathematics. In 1910, Georges’ father got a new job, taking the family to Belgium’s capital city, Brussels. Georges, now age 16, enrolled at another Jesuit school, the College Saint Michel. His teachers noticed his outstanding abilities in mathematics and the physical sciences. Although he still liked the idea of becoming a priest, Georges decided to study engineering rather than theology. In July 1913, he was awarded a diploma in engineering and started training as a mining engineer. In July 1914, World War 1 began. In early August the German Army invaded Belgium and France. Almost immediately Georges Lemaître, now 20 years old, enlisted alongside his younger brother Jacques into the Belgian Army. By October they were in action on the front line. The following April, Lemaître was a horrified onlooker when the Germans released over 150 tons of deadly chlorine gas at Ypres in Belgium. The wind carried the terrible gas towards French and Canadian trenches rather than Belgian ones. The German Army released over 150 of deadly chlorine gas at Ypres, carried by the wind into allied positions. Amid the pervasive fear, brutality, and death of trench warfare, Lemaître’s comrades were amazed by his ability to disconnect his mind from his surroundings and study physics books whenever he got the chance. This ability was characteristic of Lemaître’s orderly approach to life. Lemaître and his younger brother survived the war, which ended in November 1918. Lemaître attained the rank of master sergeant and won the Croix de guerre medal for bravery. He would have become an artillery officer, but was expelled from training after telling an instructor that his ballistics calculations were wrong! With the war behind him, Lemaître abandoned engineering to pursue his dreams. He enrolled at the Catholic University of Leuven to study for an advanced degree in mathematics. In 1920, age 26, he was awarded with the highest distinction a Docteur en Sciences in mathematics for his thesis The Approximation of Real Functions of Several Variables. Lemaître also secured a baccalaureate in Thomist philosophy, the philosophy of the thirteenth century Italian priest Thomas Aquinas, which underpins the Catholic Church. His next step was to begin training for the Roman Catholic priesthood, entering the House of Saint Rombaut in October 1920. His professors, noting his continuing interest in mathematics and physics, suggested he study Albert Einstein’s work. Lemaître did this, learning about tensor calculus and general relativity from books written by the famous mathematical astronomer Arthur Eddington. In 1922, Lemaître submitted a thesis, The Physics of Einstein, which won him a Belgian government scholarship. He was ordained as a priest in September 1923, age 29. Rather than becoming a regular priest, however, Lemaître used his scholarship to spend a year at the University of Cambridge in the UK studying general relativity. Eddington asked Lemaître to apply the rules of general relativity to the contents of the sphere and see what the result was. Lemaître discovered two solutions to Eddington’s problem: the first was consistent with a proposal Einstein made in 1917 of a closed, stable, static universe whose energy-mass density is constant; the second was consistent with Willem de Sitter’s proposal, also in 1917, of a universe whose large-scale behavior is dominated by the cosmological constant (the energy density of empty space). Next it was Cambridge again, but this time Cambridge, Massachusetts. Lemaître crossed the Atlantic to carry out research at Harvard University, and he also registered as a candidate for a physics Ph.D. at MIT – the Massachusetts Institute of Technology. During his time in the USA, he traveled widely, meeting many of the country’s top astronomers and physicists, including Forest Ray Moulton, William Duncan MacMillan, Vesto Slipher, Edwin Hubble, and Robert Millikan. He returned to Belgium in the summer of 1925 and, strongly supported and recommended by Eddington, was appointed associate professor of mathematics at the Catholic University of Leuven. He actually got his Ph.D. in 1927 when he made a trip to MIT to defend his thesis: The gravitational field in a fluid sphere of uniform invariant density according to the theory of relativity. In 1927, Lemaître set out his manifesto in a paper whose title proclaimed that the universe’s mass is constant, but its radius is increasing, causing its galaxies to move apart. Henrietta Leavitt’s distances to stars: the light emitted by a certain type of star called a Cepheid variable pulses regularly. The rate of pulsing is directly related to the star’s true brightness, so by measuring its pulse rate, a star’s true brightness can be found. Since the observed brightness of stars decreases in a predictable way when they are farther from us, Leavitt provided astronomers with a way of determining the true distances of Cepheid variable stars from Earth. Edwin Hubble’s galaxy data: Hubble discovered a number of Cepheid variable stars at distances far beyond anything ever previously imagined. Hubble’s far distant Cepheid variables were located inside structures called spiral nebulae. Hubble showed the spiral nebulae were actually galaxies separated from our own Milky Way by enormous distances. Vesto Slipher’s redshift data: Light from distant galaxies is shifted to the red end of the spectrum. Lemaître was the first person to propose that light from other galaxies is red-shifted because the very fabric of space itself is stretching. He came up with ‘Hubble’s law,’ which says that the speed other galaxies move away from our own is directly proportional to their distance from us. This means that the farther a galaxy is from the Milky Way, the faster it is racing away from the Milky Way. where v is velocity, r is distance, H is the Hubble Constant, which Lemaître calculated two values for (the second with his statistical correction): 575 and 625 km s-1 Mpc-1. Today, with the benefit of much more sophisticated observational data and better distance calibrations, H is believed to be approximately 70 km s-1 Mpc-1. Lemaître believed the galaxies are racing away from one another. 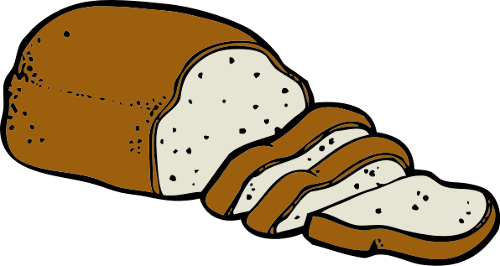 This is a little bit like rising raisin bread; from the point of view of any single raisin all the other raisins move away from it as the bread expands. Unfortunately for Lemaître, he published his revolutionary proposal in a journal few people outside Belgium read – Annals of the Scientific Society of Brussels. Two years later, in 1929, Edwin Hubble published evidence for v = Hr in the well-read Proceedings of the National Academy of Sciences of the United States of America, and received the credit for Hubble’s law. Hubble’s value for H, of 530 km s-1 Mpc-1, was similar to Lemaître’s. Lemaître, a modest man, did not make a fuss about this, and happily called the equation Hubble’s law; in fact, when he translated his landmark 1927 paper into English in 1931, he rather remarkably agreed to self-censor it, leaving out the section showing he had beaten Hubble to a calculation of H.
Unlike Lemaître, however, Hubble refused to believe the universe is growing because space is expanding. He remained non-committal about the cause of red-shifts. Others were less reticent about the cause, and a number of unusual proposals were made including a decrease in Planck’s constant with time, or a decrease in the size of atoms with time. For many years now, scientists have worked on the basis that Lemaître’s theory of expanding space is correct. Both Einstein and Eddington were uncomfortable with Lemaître’s idea. Later, Fred Hoyle described the explosive birth of the universe as a “Big Bang” and the name stuck. It is worth saying that the mathematics and physics of Lemaître’s Big Bang differ from the modern understanding of the event. For example, modern cosmologists believe the universe emerged from a singularity – an object with mass but zero size, whereas Lemaître pictured his giant primeval super atom having a radius similar to the earth-sun distance. Simplified representation of the Big Bang on the left. Looking rightward, the universe evolves as space expands and cools. Image courtesy NASA. 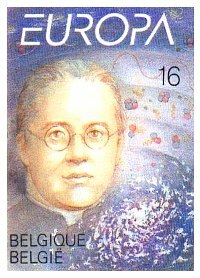 Lemaître was commemorated on a Belgian stamp in 1994, the hundredth anniversary of his birth. In 1934, Lemaître received the Francqui Prize, Belgium’s highest scientific honor. In 1936, Pope Pius XI inducted him into the Pontifical Academy of Science. In 1941, Lemaître was elected to the Belgian Royal Academy of Science and Arts, and in 1951, he received the inaugural Eddington Medal from the Royal Astronomical Society. In 1960, Pope John XXIII elevated Lemaître to the senior rank of Monsignor in recognition of his work. The Church liked Big Bang theory, because it chimed with the Biblical account of a creation event. Lemaître himself did not seek to make such a connection, believing his faith and his scientific work should be dealt with completely separately. Some of his fellow scientists, including Einstein, were at first suspicious of the Big Bang because they (wrongly) believed Lemaître’s proposed beginning of the universe was religiously motivated. Lemaître’s view was that God had constructed a universe accessible to the human mind, and mathematics and science were the doors through which the truth could be discovered. Lemaître, in accordance with his vows as a Roman Catholic priest, never married and had no children. He enjoyed company and was a fun person to be around, always laughing, smiling and joking. He enjoyed drinking red wine and eating good food; in his later years, just like the universe, his body expanded with the passage of time. Although he founded Big Bang theory and believed devoutly in God, he was very good friends with Fred Hoyle, who opposed Big Bang theory and did not believe in God. In December 1964, age 70, Lemaître suffered a heart attack and retired from his professorship. Georges Lemaître died, age 71, of leukemia on June 20, 1966 in Leuven, Belgium, and was buried in the Marcinelle cemetery in his hometown of Charleroi. Shortly before his death, he learned of Arno Penzias and Robert Wilson’s discovery of the cosmic microwave background radiation, providing strong evidence that the universe had indeed begun in a Big Bang. "Georges Lemaître." Famous Scientists. famousscientists.org. 7 Feb. 2017. Web.